Yes! 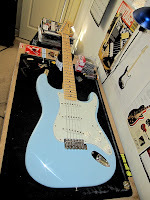 I finally got one of my favorite Strat colors, Sonic Blue, and on one of my favorite Strat models, the Yngwie Malmsteen signature Stratocaster. 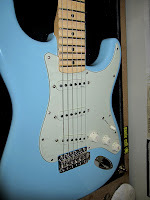 I have wanted a Sonic Blue Malmsteen Strat for a while now so when I came across this one I jumped on it. Unfortunately, I had to trade my Custom Shop '60 Relic Strat for it (I also got some cash in addition), but so far I can report that it was well worth it. I loved the Relic Strat but the tone was just too thin and harsh for my taste (even despite trying different pickups), so I decided to move it. This American made Malmsteen is a 2001 make with a maple fretboard, nice deep scallops and the usual huge fretwire (Dunlop 6000, I believe). It is identical in every way to my '05 Vintage White Malmsteen, but I believe the fit and finish to be a tad bit better on this one. The really awesome thing about this guitar is that despite being 7 years old, it's brand new. And I mean brand new! This particular specimen was bought by the previous owner to collect so it has never been played, has all the hang tags on it and the cellophane pickguard protector still applied. Even the trem arm sticker dot that keeps the arm spring from falling out hadn't been removed. This guitar is factory mint. I have a new set of pickups currently on order for it. Since I am now in a band (and especially since I plan to gig this guitar) I have to be able to get a certain type of tone from my instruments that compliments the music that we play. 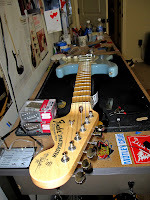 In the case of Stratocasters, I usually prefer having a humbucker in the bridge position and a couple of good, high-output, fat-sounding single coils in the middle and neck positions (nothing too ice pickish). My favorite set for a Strat at the moment (and the set currently in my '05 Malmsteen) are: the DiMarzio Fast Track 2 single coiled sized humbucker (bridge) and two DiMarzio Virtual Vintage Blues single coils in the middle and neck positions. I also install a treble bleed on the volume knob potentiometer so that the tone stays nice and crisp as the volume is rolled off on the guitar. Other than pickups, I plan to install an off-white pickguard to replace the mint-green one currently on it. The off-white color is the most typical pickguard seen on Yngwie's guitars. Also, with the creme pickup covers I have on order the contrast between the off-white guard and the creme covers will look cool and have a vintage vibe. At the moment, no other mods for this guitar are planned (other than Schaller strap locks). The neck is a fine piece of craftsmanship. It is very level with an easy adjusting truss rod and it feels and plays beautifully with minimal to no buzzing anywhere on the neck. The brass nut is superbly cut and the bridge parts are the typical Fender steel vintage trem fare. Should be easily whipped into shape and made playable in no time. I can't wait to get it broken in so I can start gigging with it! I can definitely say that I am very pleased with this acquisition. That's incredible. I've always wanted a Malmsteen Strat. Whoo-hooo! That blue guitar looks absolutely stunning. Design, look and features everything is just fantastic.